Anti-Diarrhea is a pleasant tasting liquid suspension for use as an aid for non-infectious diarrhea. Kaolin is an anti-diarrhea ingredient for the absorption of toxins. This absorbent action helps alleviate the irritation, discomfort and cramping associated with diarrhea. Pectin is a soluble dietary fiber naturally present in citrus fruits. 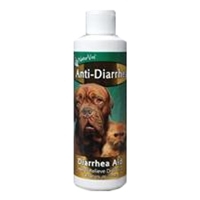 It helps relieve simple diarrhea and gastroenteritis in dogs and cats. © 2019 Booth's Corner Pet Supply. All rights reserved.